Seville’s central streets echo with the sound of hooves before the flamenco chords set it. The yellow-wheeled carriages carry tourists around the city’s main attractions and through the María Luisa park. It’s a romantic way to see the city, particularly for horse lovers (or those willing to pay to be whisked around). Growing up, I spent my Sunday mornings at the barn, learning to care for horses. I was amazed at just how powerful the creatures were, and how gentle they became after being tamed. Pudge, my mother’s first horse, was an important part of our family until I was 22. When my family came to visit shortly after putting Pudge down from an injury, I mentioned the horse rides. My mother staunchly refused, unwilling to take part in anything she hadn’t been properly informed about. After all, we hear about the cruelty towards work horses in New York City. As it turns out, most Spaniards are great animal lovers, and the horse is one of its most revered creatures, valued for its beauty, power and noble personality. Not every country has such a special relationship with animals. 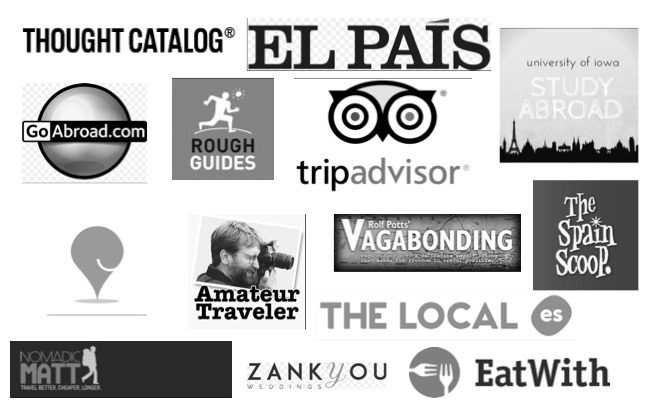 I’m proud to be a part of the Travel Blogging Calendar this year. Service and charity have always been a part of my life, which is why I decided to walk the Camino de Santiago to raise awareness of pediatric cancer and raise money for a charity that’s very special to me. The Travel Blogging Calendar has used influencers in the industry to be a voice for the voiceless, including orphanages and disaster relief funds. This year, proceeds from the digital calendar will go to the Save the Elephant foundation located in Chai Ming, Thailand. This city is a backpacker mecca, and thus poachers capitalize on tourism by capturing elephants and using force to subdue and domesticate them. This process is called phaiaan, and it’s based on fear. If you ride on an elephant you, in short, are promoting this horrible practice. The foundation and its animal park, Elephant Nature Park, use a technique of positive reinforcement to reverse phaiaan, and the park is now home to 26 pachyderms. 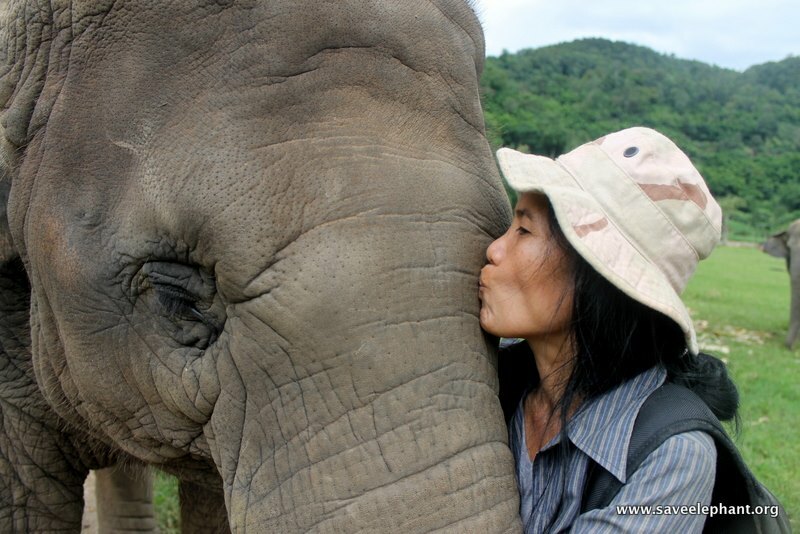 Each of the elephants has been bought legally, and park founder Lek Chailert has been saving elephants since 1995. 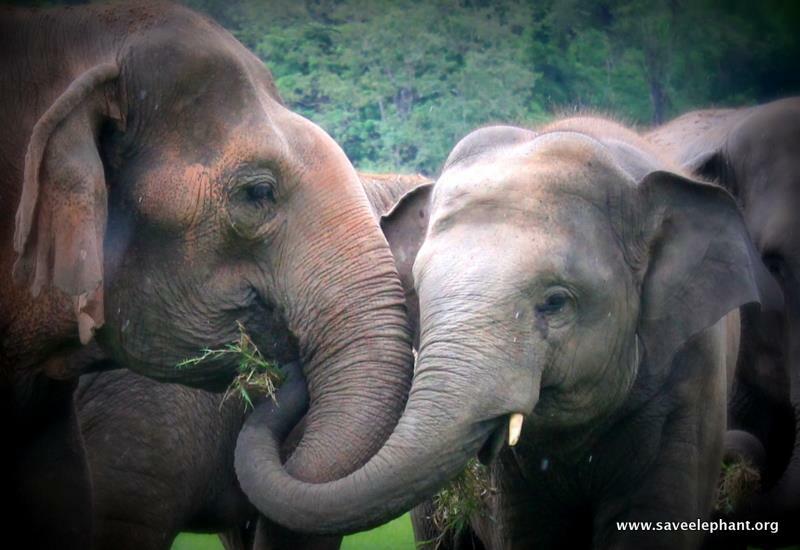 Here’s the thing: it’s hard to not want to cuddle up to elephants – they’re adorable – and support local economies. But please be informed about how your dollars or euros could be affecting our four-legged friends. Tourism is a double-edged sword: while it can keep economies from collapsing, it also promotes terrible practices and has the potential to destroy culture and tradition. I’ve always operated under the “You get what you give” motto, both in my classroom and my life outside of it. This prize rewards your generosity and voice in the fight against animal cruelty with a pretty sweet prize that will take you to the place where it all happens: Thailand. 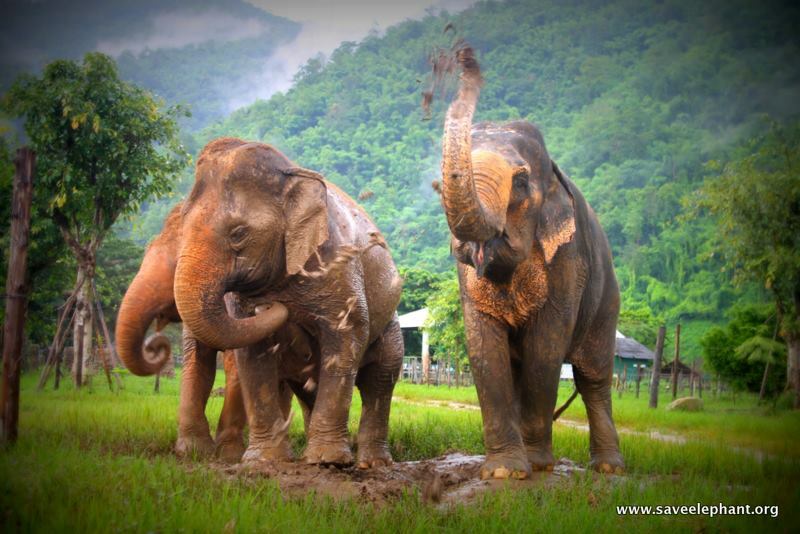 I know you’re interested in winning a $2000 voucher from Flight Network towards a flight to Thailand and an week-long, customizable tour from Where the Sidewalk Ends for two people, which includes visiting the Elephant Nature Park. The contest will be held in raffle form, but a small gift towards stopping animal cruelty can mean a trip of a lifetime. And here’s the best part: The prize is valued at $3300. You can purchase the digital calendar, which is in blog format and will allow you to travel around the world weekly, thanks to blog posts by other big names in travel blogging. A newsletter will also keep you abreast of fundraising efforts and the bloggers involved. The amount of money you donate directly correlates to the number of entries you receive. For example, $20 gets you 10 raffle “tickets,” so a high donation means more chances to win. Sharing on social media through rafflecopter will also mean more entries. Entering is easy – donate using this website, then use the widget to share on social media. Using your voice to spread the word about the harmful practice of phaiaan is just as appreciated. The flight is a $2000 voucher, donated by Flight Network, that you can put towards a flight to Thailand. The tour with Where the Sidewalk Ends includes hotel, tours and transport, along with a trip to the park to meet Lek and her pachyderms is for two people. More information can be found on the Travel Blogging Calendar website. You can also support the organization by sharing their story through Facebook or Twitter. For more on Lek Chailert, the founder of this organization, check out her interview on Green Global Travel. Please consider a small gift to help Lek continue the work she does, or even by sharing this post on social media. People really can change the world with small actions, and I appreciate you reading about this incredible cause and the great work it does daily. Andalusia, Spain’s southernmost region, is synonymous with many things: flamenco, sun and sand tourism and bullfighting. It’s also the breeding grounds for the Andalusian horse, a strong and powerful race favored by Moorish kings and thought to have evolved from the Portuguese breed. 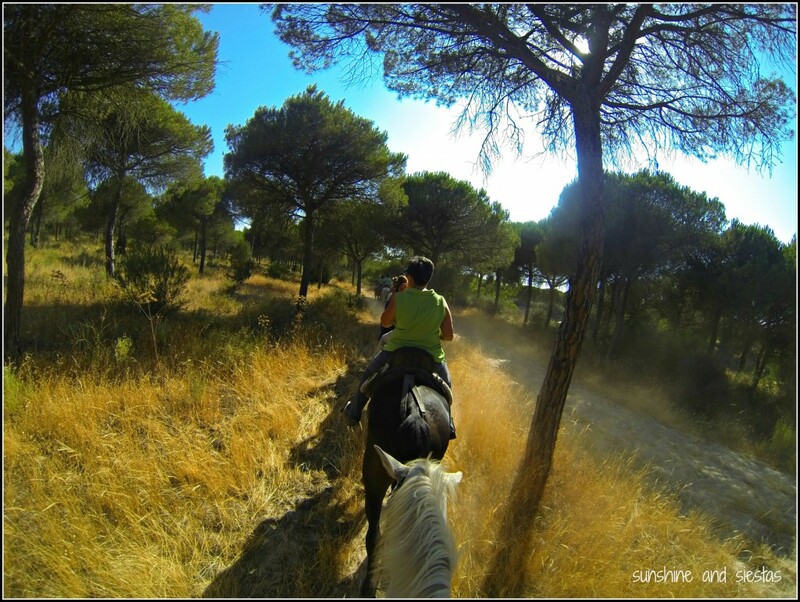 It’s common to see horses in Southern Spain used for sport – rejoneos, hunting and plain old riding – as well for work. When my mother came to visit in June, she had one thing on the brain (and the tongue, as it’s the only word she could say in Spanish): caballos. I took my pony-loving parent on a tour of Andalusia’s most famous horse sites, including a visit to the Novio’s farm, which is recognized as an ANCEE Andalusian breed farm. Horse crazy? Andalucía is a great destination if your brain is more focused on the equine world than tapas. 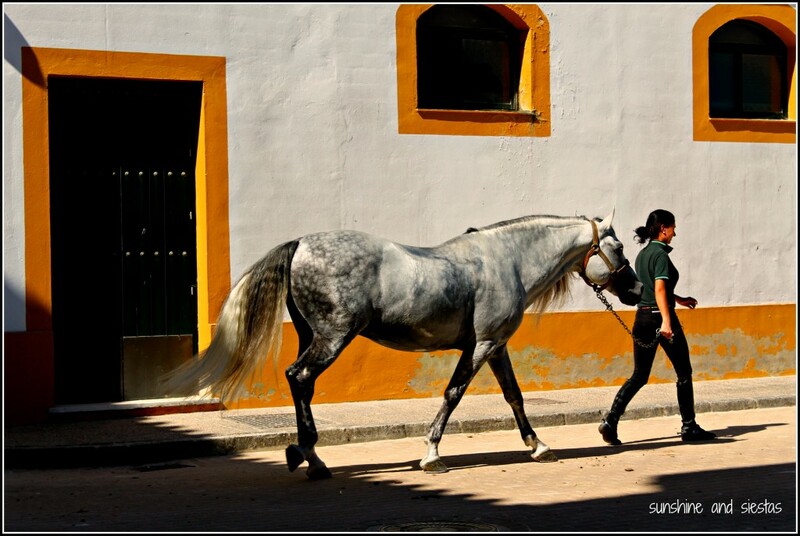 The largest city in the Cádiz province, Jerez is famous for its dry sherries and horse breeding farms, called yeguadas. 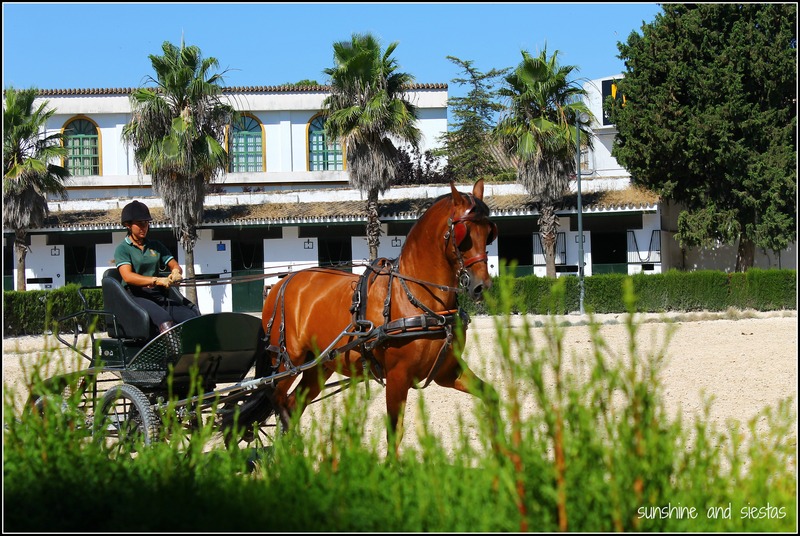 Jerez is just less than an hour away from Seville by car and makes a great day trip, as you can hit all of its sites and catch a show at the world-famous Andalusian horse training grounds. Andalusian horses are world-famous for their agility, and the Royal Andalusian School of Equestrian Art is home to the show, ‘How the Andalusian Horses Dance.’ I took my mother to this 90-minute spectacle, similar to the Lipizzaners in Vienna, and I was mesmerized by their abilities to jump, side step and control their stops. Even at its steep price, sitting in the front row was worth it. Jerez’s version of the Feria is just as brightly colored and fun as Seville’s, just not as pretentious – all the tents are free to enter, you won’t get run over by a horse carriage because the streets are wider and there’s even Mexican food and hard rock tents. What’s more, it’s a living horse show, and the Andalusia giant is put on display. 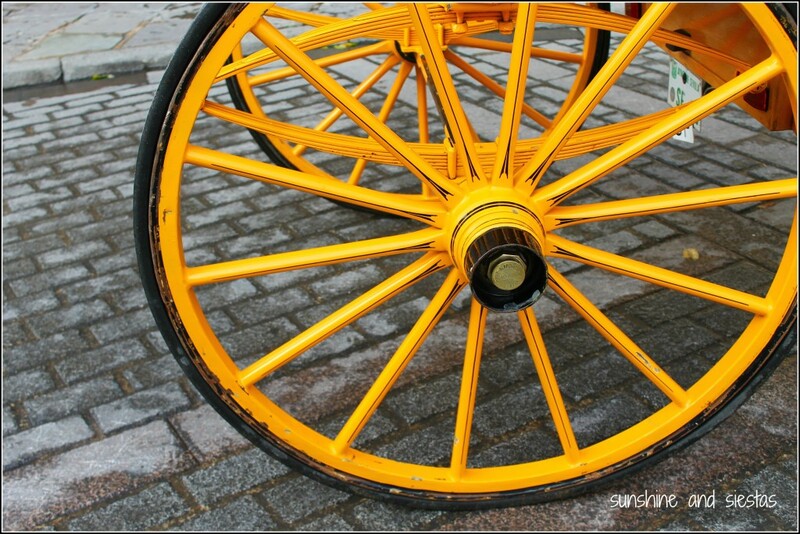 There are workshops, shows, contests and carriage parades all week-long. The fair typically falls in May, about a month after Seville’s annual Feria de Abril. 2014’s dates are May 11th to 18th. 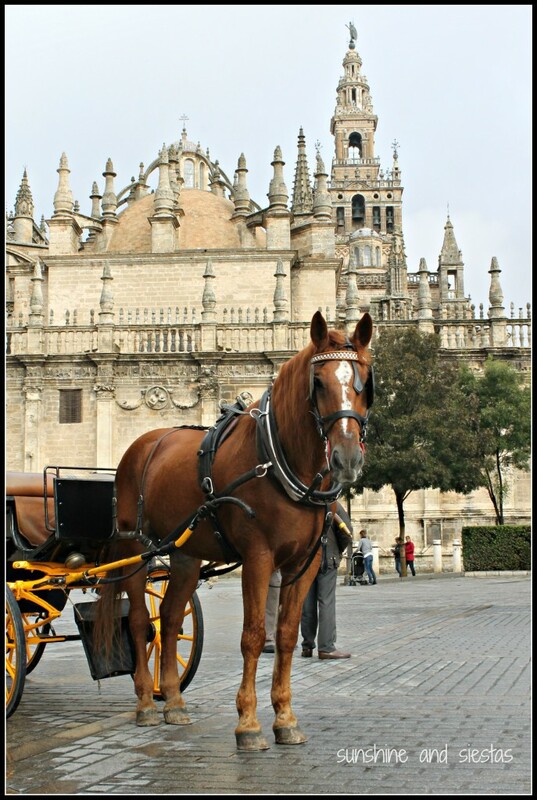 Seville resonates with the clip-clop of hooves in the city center. Horses are everywhere in the bustling Andalusian capital, used mainly for horse carriages, mounted policemen and in bullfights. The annual Feria de Sevilla is full of carriage exhibitions and parades, but this horse-friendly city offers more. Horse carriages are one of the city’s most romantic rides – it’s impossible to drive near the city center or María Luisa park without giving yield to one of the open-top buggies. While I’ve never done it, you can hire a driver near the cathedral or park and take in the sights, regardless of the weather. A 45-minute trip will run you about 40€, plus a tip for the driver. There is an official rate for the city, displayed on signs near the official pick-up points, so be sure to negotiate the price with the driver. 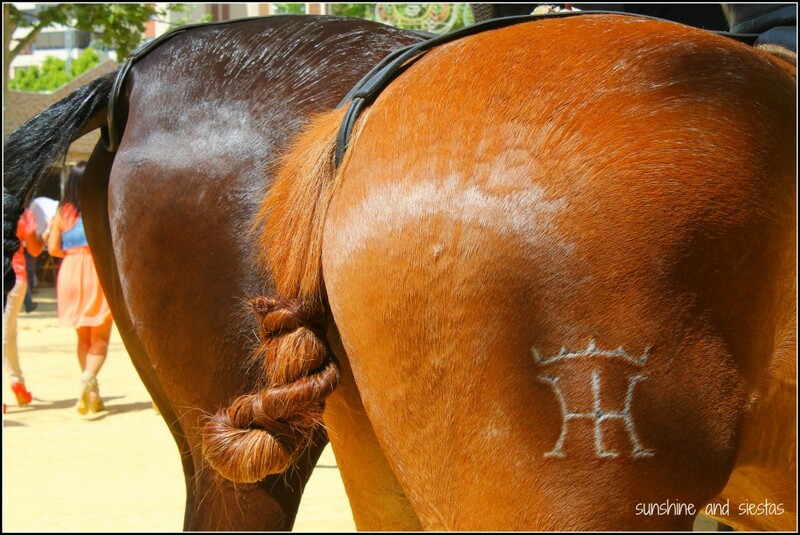 The Salon International del Caballo is an annual horse show and fair held in Seville, typically in November, and considered one of he city’s biggest tourist draws. You’ll find breeders and designers with booths in the Palacio de Congresos dedicated to the Pura Raza Española, and the equestrian championship is also held during the event. 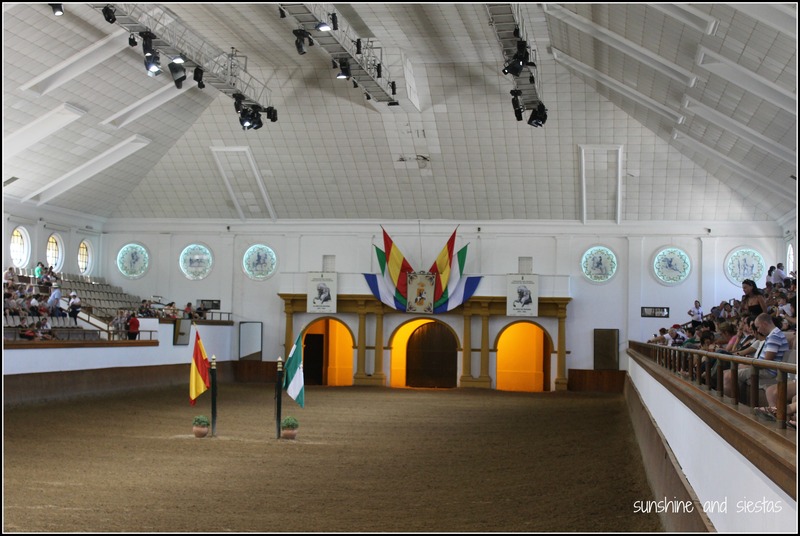 Thoroughbreds are displayed in an exhibition hall for purchase – almost like a throwback to the origins of the Feria. The Novio’s family gets free tickets each year for being an ANCEE-approved farm, but I usually just go in the hopes that I’ll see the Duquesa de Alba. (This year’s even will be held the 3-8th of December). Not everyone adds Huelva to their list of musts while in Andalucia (even though you should! 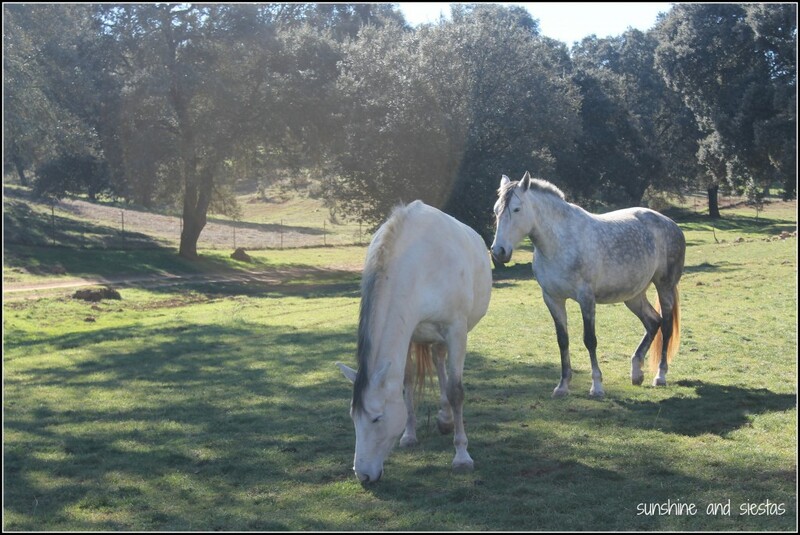 ), but there are horse-friendly things to do in the province wedged between Sevilla and Portugal. I would have loved to take my mother to the annual Saca a las Yeguas, when the wild horses in The Doñana swamps are rounded up, blessed in front of the majestic chapel at El Rocío, and then driven to nearby Almonte to be sold. For the last 500 years, this festival has been held on June 26th to commemorate Saint Peter. During the five days that follow, the horses are trained, shown off and sometimes bought, with special attention towards the foals. Almonte is only an hour away from Seville and reachable by Damas bus or car. Are you a horse lover? 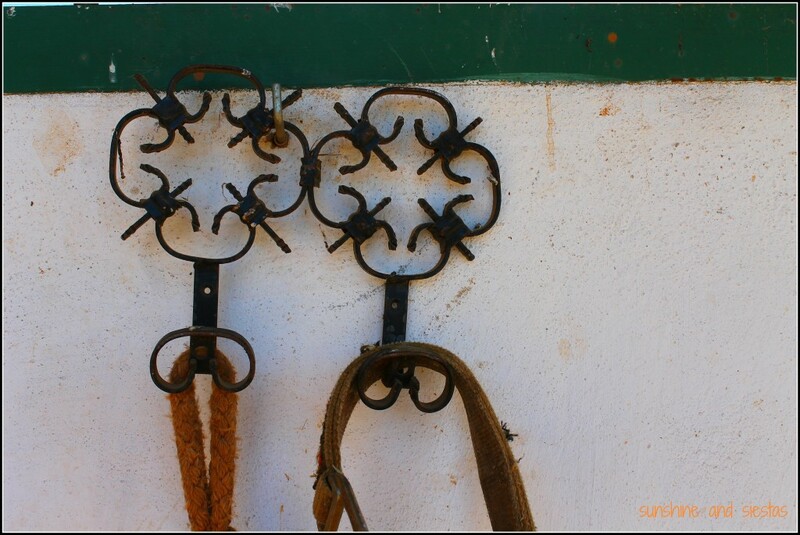 What are your favorite equine events or activities in Spain?